The political party founded by murdered Russian dissident Boris Nemtsov is to join forces with another opposition party ahead of Russia's 2016 elections. RPR-Parnas will share a joint platform with the Party of Progress, founded by opposition activist Alexei Navalny. Russia's political opposition has in recent years been riven by infighting, weakening its ability to challenge President Vladimir Putin. A former deputy prime minister, Nemtsov was gunned down in Moscow in February. In a joint statement on Friday, the two parties called on opposition figures to "consolidate on a common platform of a rejection of lies, corruption and aggression". Mikhail Kasyanov, co-chairman of RPR-Parnas and a former prime minister, said the parties would form an alliance rather than merge. Mr Kasyanov later announced they had been joined by a third party, Democratic Choice, led by a former energy minister, according to Russia's Interfax news agency. "We expect that our movement will continue and other opposition parties will join us," Mr Kasyanov said. The parties said they would begin by running together in regional elections due to be held in 2015 before the full parliamentary elections due in 2016. Mr Navalny, an activist and regular blogger, is among Russia's most prominent opposition figures. He has twice been convicted of embezzlement, spending time in jail in 2013 and receiving a three-and-a-half year suspended sentence in December last year. Mr Navalny denied the charges in both cases, saying the trials were politically motivated. 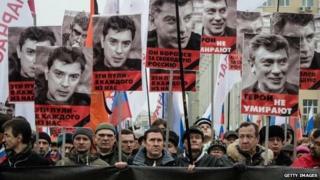 Critics of Mr Putin accused him of being behind the murder of Mr Nemtsov, who was shot dead near Moscow's Red Square as he walked home with his partner. Mr Putin denied having any involvement. As the two parties made their announcement on Friday, Russia's state news agency released what it said was an extract from a confession by Mr Nemtsov's killer. Zaur Dadayev, a Chechen policeman who was arrested with four alleged accomplices days after the murder, was initially said by authorities to have confessed to the crime. But a member of Russia's human rights council who visited Mr Dadayev in prison said there was evidence the policeman had been tortured into giving his confession. Mr Dadayev himself said there was no evidence against him, and that he had made a confession after being threatened with death.